Using case studies from the post-Soviet region, the contributors to Presidents, Oligarchs and Bureaucrats explore the character of post-Soviet regimes and review the political transformations experienced since the end of the Cold War. Through a combination of theoretical approaches and detailed, empirical analysis the authors highlight the difficulties and benefits of applying the concepts of hybrid regimes, competitive authoritarianism and neopatrimonialism to the countries of the post-Soviet space. Liz Carolan finds that the authors offer some ways to address an uneven playing field which may be of use to those currently focused on support democratic transitions. 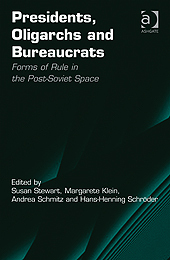 Presidents, Oligarchs and Bureaucrats: Forms of Rule in the Post-Soviet Space. Susan Stewart, Margarete Klein, Andrea Schmitz and Hans-Henning Schröder (Eds). Ashgate. 2012. In the fading optimism of the Arab Spring, it is easy to be struck by the familiarity with that which followed the collapse of the Soviet Union. Those who remember this disillusionment tried to temper the optimism of a new generation during the push for democratisation across the Middle East and North Africa. These observers had believed in the ‘transition paradigm’ that emerged from the wave of democratisation in the 1970s across Latin American and southern European nations; and they had watched it discredited as autocracy stubbornly held fast. This book focuses on the “grey zone” between democracy and autocracy that emerged in the post-Soviet space in the 1990s and 2000s to challenge the paradigm which had presumed transitions would lead to democratic rule. The authors do not make the connection explicitly, but their examination of how and why fully democratic states failed to emerge from the collapse of the Soviet Union presents theoretical and empirical context of interest to those thinking about current developments in the Maghreb and elsewhere. The book begins with a mixed picture of transitions to democracy as the Soviet Union collapsed, with some progressing rapidly (for example in the Baltics) and others stalling (much of Central Asia). It uses empirical case studies from across the region – namely Russia, Ukraine and Georgia, and Central Asia – to explore some of the theoretical dilemmas that the last two decades have thrown up for scholars. One puzzle of particular interest from the “grey zone” is why apparently free and fair elections in many places failed to result in the changes of government one would expect in a democracy. Put simply, why did incumbent parties so rarely lose? The theory emerged as an attempt to explain the fact that some regimes managed to hold genuinely competitive elections without any real prospect of the opposition winning. These elections were not characterised by stuffing ballot boxes or outlawing rival political parties; in a post-Cold War world, we read, this gives a state unwanted international criticism. Rather, competitive authoritarianism is characterised by the creation of an uneven playing field which can have a “devastating impact on democratic competition”. This playing field is characterised by systematically denying the opposition access to resources, the media and the law equivalent to that enjoyed by incumbents. Incumbent parties will inevitably have advantages in any electoral campaign, and UK and many other countries put in place rules and conventions to prevent abuses or the inappropriate use of state resources for political campaigning or for political activity. What competitive authoritarianism describes are “hyper-incumbent” advantages that allow incumbents to thwart opposition challenges without resorting to fraud or repression. One such example looks at access to resources, where the authors describes how Boris Yeltsin is said to have diverting tens of millions of dollars of state resources to his 1996 re-election campaign. This, they tell us, resulted in the incumbent spending between 30 and 150 times the amount permitted to the opposition. Quite often incumbent advantages are entrenched between elections. On legal system capture, another example illustrates, the constitutional court halted impeachment proceedings against the Belarusian President, allowing him to consolidate his rule. As a concept, “competitive authoritarianism” may help to explain the frustration experienced when pure electoral fraud is absent, but when there is very clearly not a level playing field for parties. There are contexts in which elections are a façade or a farce – Pamela Jawad’s chapter on Georgia points to the elections under the incumbency of Shevardnadze as an example. What competitive authoritarianism does is much more subtle in its manifestation, as the end of the Cold War made it unacceptable for states to continue as authoritarian regimes and maintain legitimacy internationally. It has long been acknowledged that transitions to democracy require a lot more than elections, or even good institutions of government. The theoretical frameworks elaborated (though not originally developed) in this book provide a helpful lens through which to view transition states that goes beyond this again. This lens focuses on the political playing field as a key factor in embedding truly democratic systems in countries emerging from autocracy. It has at its centre the support given to opposition in transitional states, and thinking about what they need in order for democracy to thrive. The authors offer some ways to address an uneven playing field which may be of use to those currently focused on support democratic transitions. Chief among them are guaranteed public finance for parties and regulations that encourage pluralist media and strengthen independent media. They also suggest a role for external parties. Support for political parties to reach voters is key, albeit tricky to achieve in practice. So too is support civil society organisations which can support domestic oppositions to compete on a skewed playing field, before it has become entrenched. Liz Carolan has been working at the Institute for Government since October 2010. Her research has focused on the international comparison of ministers and cabinets, the role of senior experts in the development of health policy, and the selection of candidates to be MPs. She recently received a postgraduate degree from the London School of Economics, having spent a number of years doing research and development work with civil society and academic organisations in Ireland, the Balkans and Australia. Read reviews by Liz.